While we are all recovering from my last post with its deep spiritual questions, I thought we might turn our attention to the month of May. A lighter subject. While, regrettably, it is no long National Poetry Month, May has many interesting honors of its own. It is probably best known for Mother’s Day and Memorial Day, both very worthy remembrances. We are also to watch our blood pressure this month (especially important after all that barbecue) and to be aware of our Mental Health. Of particular interest to me, however, is that May is “GIfts from the Garden” month and National Photograph month. I am going to help you celebrate them both at once! This morning at 8:36 AM, I received the first of these images. There had been a light shower and the garden was coming alive. This evening, at 6:11 PM, I received this second image (the same subject) from a slightly different angle. A simple, natural change, this transition that occurred over a period of less than 10 hours. What is so extraordinary to consider, however, is that this is but one tiny corner of the earth. Every day, all over the earth, life, in small and large forms alike, is living gloriously, abundantly, through its magnificent cycle. Opening, closing. Living, giving birth and dying. All because the Creator made it so. A “gift from the garden”, indeed. Urban dwellers like me can too often forget what is going around us and in us. Our minds are somewhere else. May: a time to remember to view the gifts of our earth through the lens of now – and give glory to God. This entry was posted in Uncategorized on May 11, 2017 by mary. The poem a verbal representation of the two photographs. It starts off with the name of the flower, which also is understood as a person, who is shy about the “risk” of opening herself to (or through) a sun (=son= Christ) ray, but says “ok” and thus the two of them (sun and son) enable her to live fully. How’s that for an interpretation? May May flower in us, and open all our tombs. Wow. A winner so early in the contest! And you dared to give voice to that lovely duplicate that I chose to avoid (May May). Good work, Al. Your prize will be announced shortly. 🙂 However, so that others may still have a chance to win (I never said there wouldn’t be more than one prize), readers may still expand upon this interpretation or make an entirely different one..
May is quite a month with lots of action/connotations, etc, some not so good such as May 1 being Workers Dayor May Day which became the big day of the year for international communism. The Mexicans here in America celebrate Cinco de Mayo on May 5 as what we call Independence Day whereas in Mexico itself, they celebrate their real Independence Day as “Cry of Dolores, (Spanish) Grito de Dolores.” Yesterday, I was in the chair at the dentist in the nearby small town of Reedley, CA and my wife was waiting in the car catching up on reading and napping. She noticed a constant flow of Hispanics going into a nearby florist shop and coming out with armloads of floral arrangements. She had thoughts about what kind of local event would cause this such as a funeral, wedding, a quinceañera (a rite of passage for fifteen year old girls, or perhaps even honoring someone such as a retiring school teacher. The she suddenly remembered, May 10 is Mother’s Day for many around the world, not necessarily on a Sunday. Then of course there is Memorial Day on May 31st to finish out the month. My first Memorial Day memory was May 31, 1945 when the U. S. War Dead were remembered as the focus of the war became the last Axis power, Japan (I was then 7). In the next year, 1946, there was gasoline for the automobiles and my grandmother resumed a family tradition where all of the women and the smaller children of our Portland, Oregon family branch gathered at her house to pick and arrange flowers before starting our tour of the cemeteries in the Portland area to put flowers on our family graves. That annual event was a memory for me in later years because I later in life realized that those graves were my graves, my forebears and their children (aunts, uncles, cousins) to remember. Living far from Portland and with all of that family gone on to their reward, I can only remember and converse with my sister on the telephone about those days. 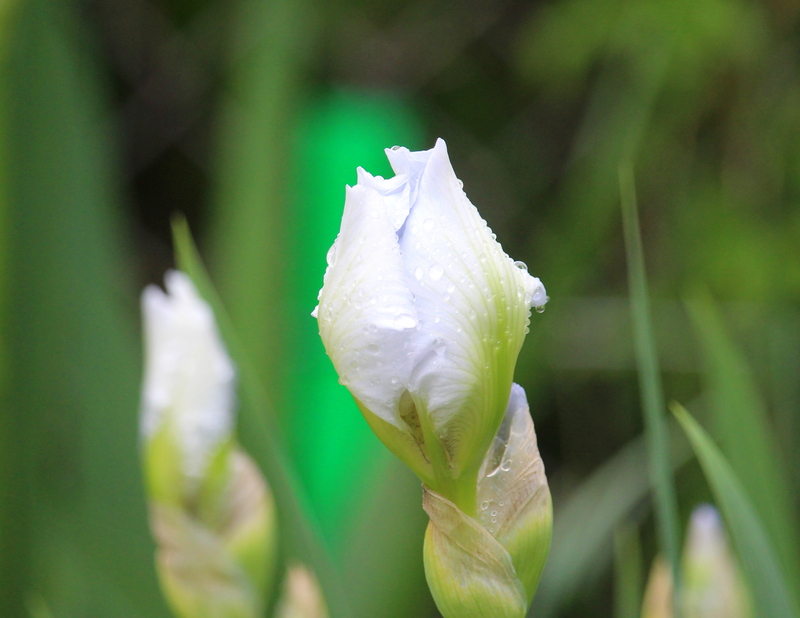 It is raining here today, May showers, and I just went to the front door and looked at my iris and found that there were still a few beauties in their pristine flowering prime, but most of them are going through their next stage of existence. The iris’s mythology dates back to Ancient Greece, when the goddess Iris, who personified the rainbow (the Greek word for iris), acted as the link between heaven and earth. It’s said that purple irises were planted over the graves of women to summon the goddess Iris to guide them in their journey to heaven. 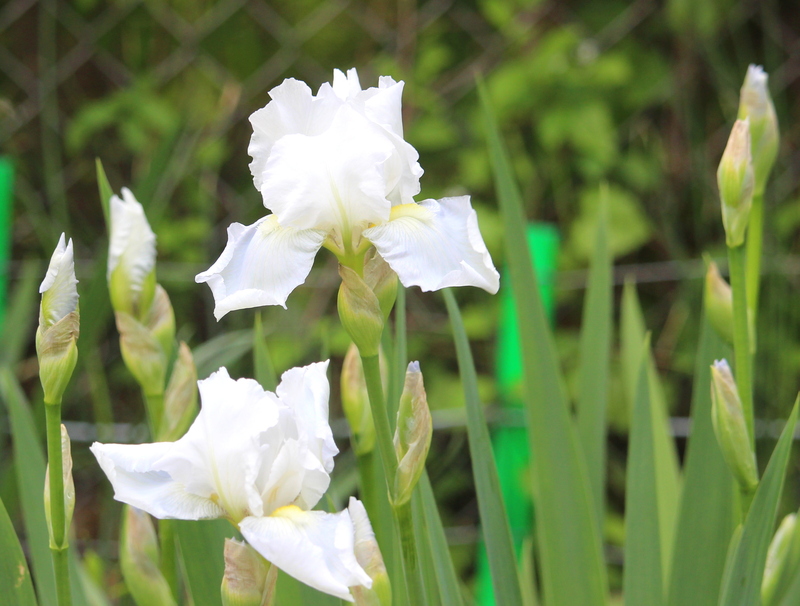 And it is interesting that the iris has many meanings to many people and that there are 325 species and 50,000 registered varieties of irises. Thanks, John, for these wonderful reflections. Remembering…sometimes there are experiences that (sadly) people wish they could forget. But to remember and reminisce and celebrate the love is a great gift. Boy, I needed this reminder. Thanks, Mary. Glad I could be of help, Jim. Perhaps I should stick to the “lighter” posts. Beauty speaks much more truly than pages of words. God is right here in our backyards (and in our hearts). Now that it is June… Al has been declared the official winner of the contest to interpret my odd little poem. He won, not by virtue of being the only contestant, but for his quick and profound insights into a rather obscure bit of verse. Congratulations, Al!